New York, Dec. 29, 1914. 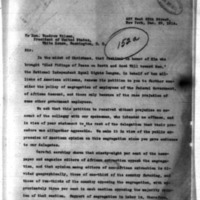 In the midst of Christmas, that festival in honor of Him who brought "Glad Tidings of Peace on Earth and Good Will toward Men," the National Independent Equal Rights League, in behalf of ten millions of American citizens, renews its petition to you to further consider the policy of segregation of employees of the Federal Government, of African descent, and those only because of the race prejudice of some other government employees. We ask that this petition be received without prejudice on account of the collequy with our spokesman, who intended no offense, and in view of your statement to the rest of the delegation that their procedure was altogether agreeable. We make it in view of the public expression of American opinion on this segregation since you gave audience to our delegates. Careful scrutiny shows that ninety-eight per cent of the newspaper and magazine editors of African extraction oppose the segregation, and that opinion among editors of non-African extraction is divided geographically, those of one-third of the country favoring, and those of two-thirds of the country opposing the segregation, with approximately three per cent in each section opposing the majority opinion of that section. Support of segregation in labor is, therefore, sectional, and opposition to it national, save for the section where a former slave condition deepened race prejudice. In view of this expression of public opinion by the citizens of the Republic, as well as of the circumstance that no other racial element is thus treated, and of the further circumstance that this racial element have made indisputably manifest their feeling of humiliation and of being greatly injured, we appeal to you at this religious festival when magistrates have by time-honored custom removed the chains, to order these segregation barriers removed for ever-loyal American citizens, and the policy of segregation in governmental labor discontinued. We ask, Mr. President, an official response to this our earnest Christmas petition. Gunner, Byron, “Nation Opposes Segregation,” 1914 December 29, CS92, Race and Segregation Collection, Woodrow Wilson Presidential Library & Museum, Staunton, Virginia.